1. A casual pencil dress featuring a funky neckline, because your business attire deserves something as lovely as this. 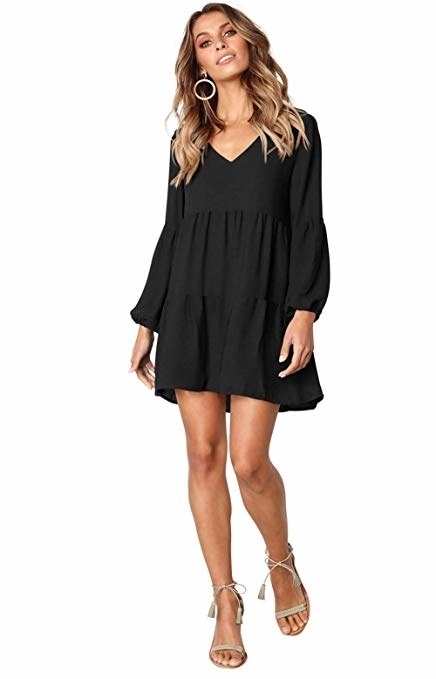 Get it from Amazon for $20.99 (available in sizes XS-XXL and five colors). 2. A shift dress in a charming floral print that comes with a literal bow collar making it the perfect gift...to yourself. Get it from River Island for $92 (available in sizes 2-14). 3. 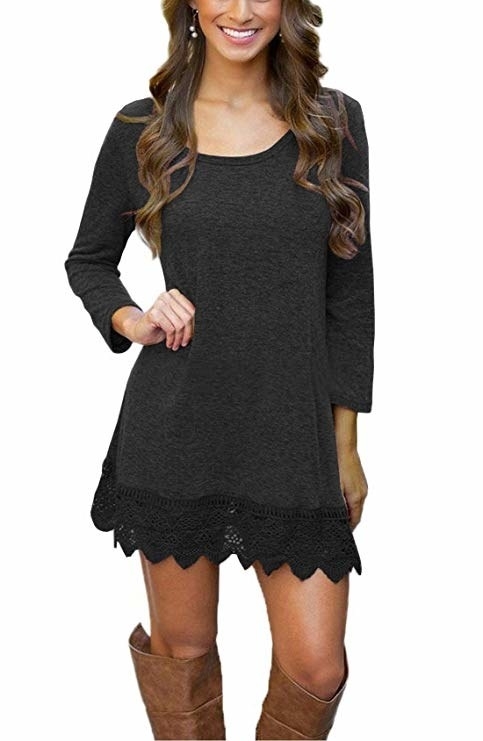 A simple little sweater dress so cozy, you'll want to live in it all chilly season long. The button detailing on the shoulders allow you to transform it into an off-the-shoulder look, or keep buttoned for a work-ready outfit. 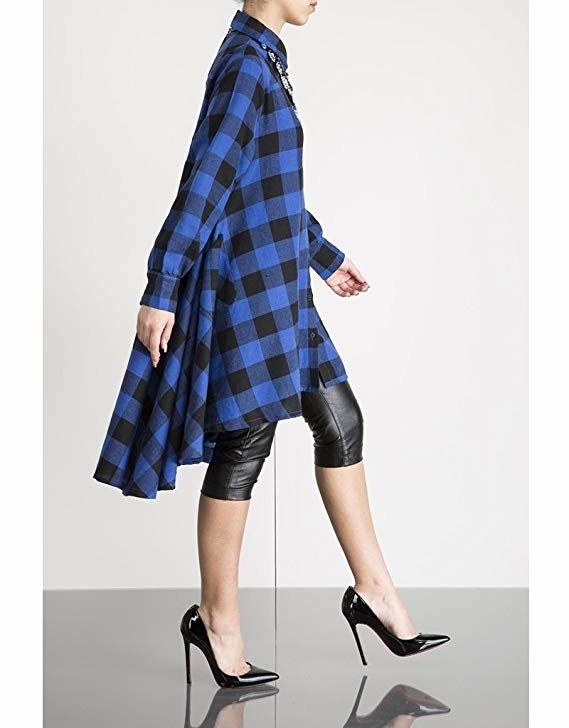 Get it from Nordstrom for $85 (available in sizes XS-XL and two colors). 4. A classic A-line dress featuring a statement-making bow that your closet will surely *fall* for all autumn long. Get it from ModCloth for $75 (available in sizes XS-4X). 5. A long-sleeved number with subtle ruffles that'll look just as cute in the summer as it will in the winter. 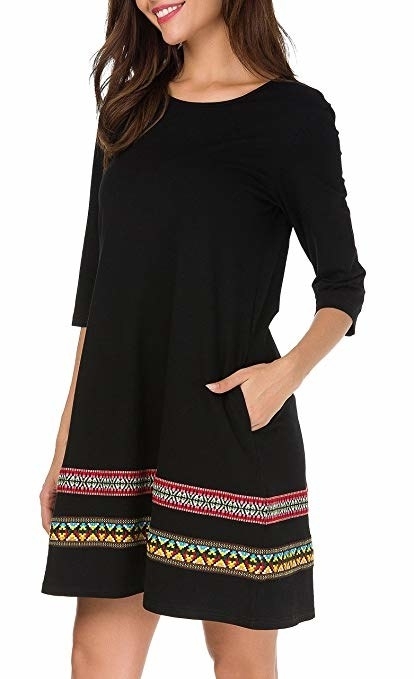 Get it from Amazon for $17+ (available in sizes S-XXL, four colors, and two sleeve lengths). 6. A color-block knit option you can throw on in the morning and look cute as all get-out. Yay for minimal effort! Get it from Asos for $40 (available in sizes S-L). 7. 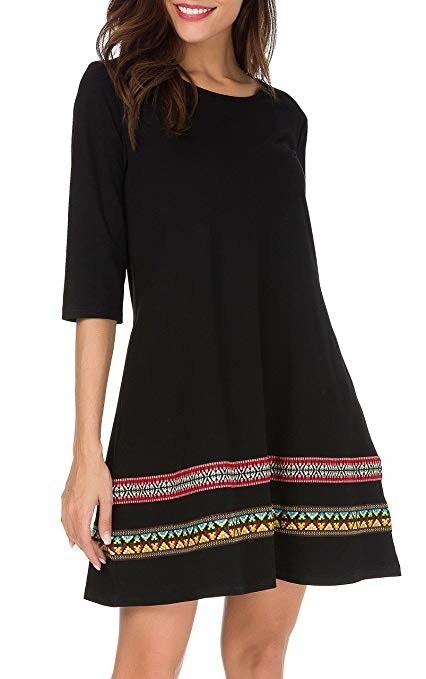 An inexpensive tunic available in tons of colors and striped-prints so ya might as well stock up and buy a bunch. Peep the button detailing that goes up the side! Get it from Amazon for $13.99+ (available in sizes S-XXL and 10 prints/colors). 8. A STUNNING sequin dress guaranteed to shine at all your fancy winter events — lookin' at you, New Year's Eve! 9. A tie-waisted mini with drapey sleeves you and your wallet will want to ~tie the knot~ with. Get it from Nordstrom for $68 (available in sizes 0-14 and three colors). 10. 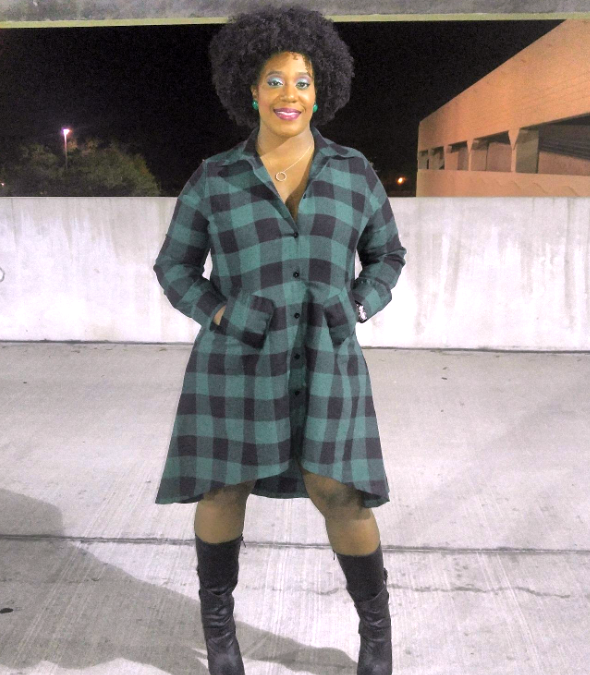 A high-low plaid dress, because EVERY closet needs a go-to plaid outfit. Now you can ~check~ that must-have off the list! Get it from Amazon for $19.88+ (available in sizes S-XXL and 10 colors). 11. A goooorgeous embroidered wrap that'll have everyone asking where they can get one of their own. Get it from Asos for $87 (available in sizes 12-24; also available in sizes 0-6 here). 12. 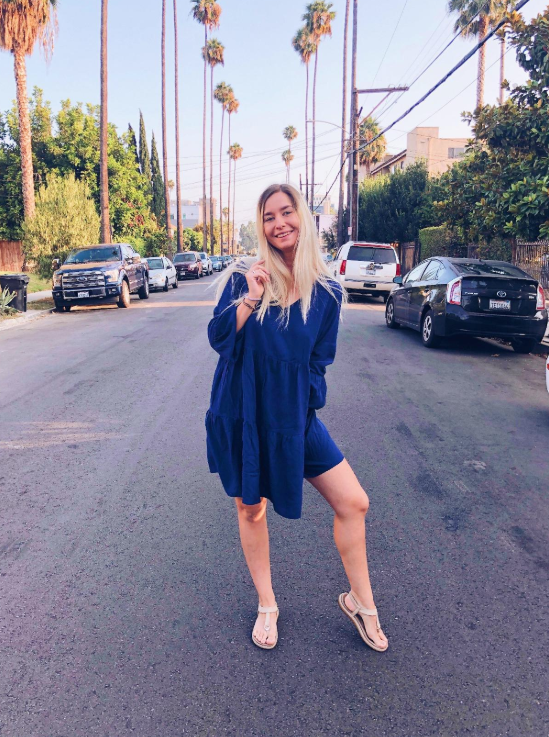 A cotton blend wrap sure to make you feel trendy as hell, but also very comfortable — and we love both of those things! Just a heads up, many reviewers suggest ordering a size up! Get it from Amazon for $18.99 (available in four colors and other styles). 13. A geo-print turtleneck dress that belonged in your wardrobe like, yesterday. 14. An oversized shirtdress for days when you want to feel comfortable but *also* look chic (me all the time). Get it from H&M for $24.99 (available in sizes 0-14). 15. 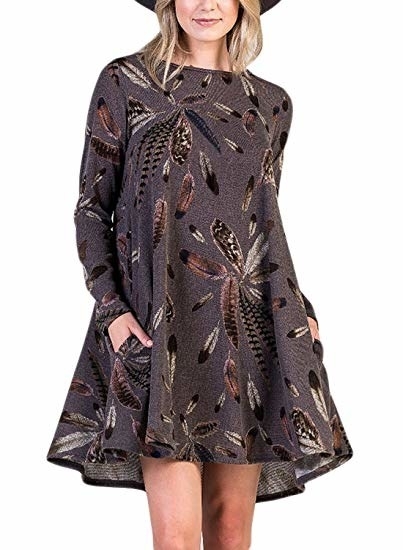 A sweater dress in a knit fabric you can probably just live in, it's so cute. Get it from ModCloth for $69 (available in sizes XS-XL). 16. A lightweight hoodie dress (hello layering!) to prove to the world that wearing a dress doesn't have to mean dressing up. 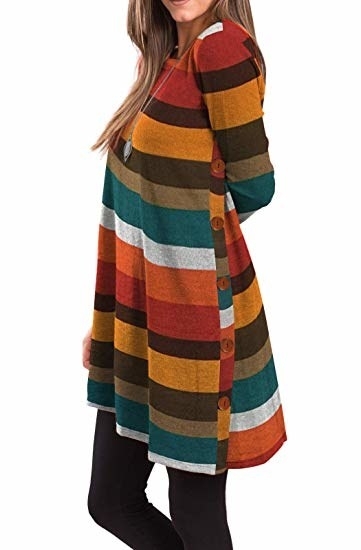 Get it from Amazon for $17.88+ (available in sizes XS-3X, 21 colors, and two sleeve length options). 17. A casual rib-knit number with a slouchy neckline that practically screams comfort. Get it from Nordstrom for $49 (available in sizes XXS-4X and two colors). 18. A mock-neck dress to give your closet a casual, work-appropriate, and stylish go-to option. Get it from Loft for $89.50 (available in sizes XXS-XXL). 19. An asymmetrical, long-sleeved dress you can wear when it's hot one second and freezing the next — ya know, typical fall weather. 20. A print shirtdress for that effortlessly put-together look you'll really appreciate on the days when you're runnin' late. Get it from River Island for $96 (available in sizes 14-24). 21. A high-neck dress in an eye-catching black metallic fabric that'll make all your other LBDs envious. Get it from Asos for $60 (available in sizes 2-12). 22. 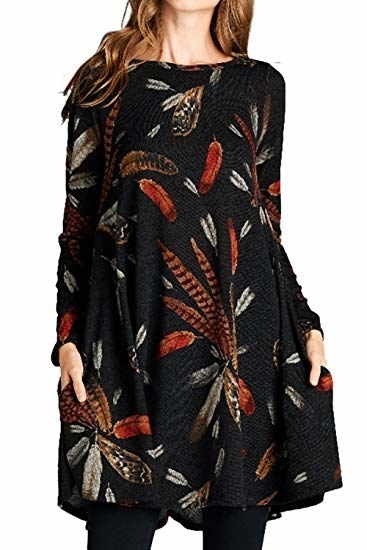 A flowy tunic with a fun feather print you can totally wear with leggings, tights, boots, and more — it's just that versatile. Promising review: "I'm in LOVE. I’m a size 18 and bought an XXL. 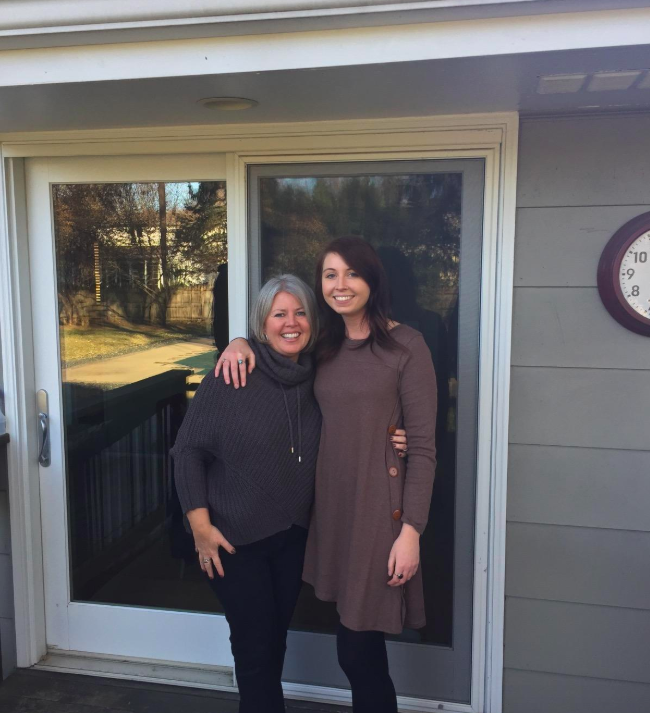 It's a perfectly flowy fit and I got so many compliments! It's perfect for fall or winter. Get it from Amazon for $21.99+ (available in is sizes S-XXL and five colors). 23. A turtleneck option for anyone who has wanted to wrap themselves in, well, just a big ol' sweater. Get it from Uniqlo for $49.50 (available in sizes XS-L and four colors). 24. An A-line mod dress that'll layer perfectly with tights, coats, and sweaters and *still* catch everyone's eye. Get it from Free People for $108 (available in sizes XS-L). 25. A simple number with a colorful embroidered hem that shows you can still make a statement even with a basic dress. Get it from Amazon for $9.99+ (available in sizes S-XL and three colors). 26. A polka dot smock so darling you should probably wear it to work, or class, or while running errands, or just all the time. Get it from Asos for $48 (available in sizes 0-12). 27. A stunning swing dress featuring a sheer overlay and V-cut back that you'll want to twirl everywhere in. Get it from Torrid for $74.90 (available in sizes 10-30). 28. A sheath dress to let everyone know that you 👏 mean 👏 business 👏. 29. A shift dress with pretty embroidered sleeves — why can't all dresses be this affordable *and* adorable?! 30. A kaleidoscope-print sweater dress that'll have anyone who sees it ~swirling~ with envy. Get it from Anthropologie for $158 (available in sizes XXS-XL). 31. A lace-hemmed dress ideal for those "throw on and go" type of days. Get it from Amazon for $11.99+ (available in sizes XS-XXL, five colors, and in short and long sleeves). 32. And lastly, a minidress with three-quarter, flared sleeves casual enough to pair with even your comfiest sneakers. Get it from Nordstrom for $44.95 (available in sizes XS-L). 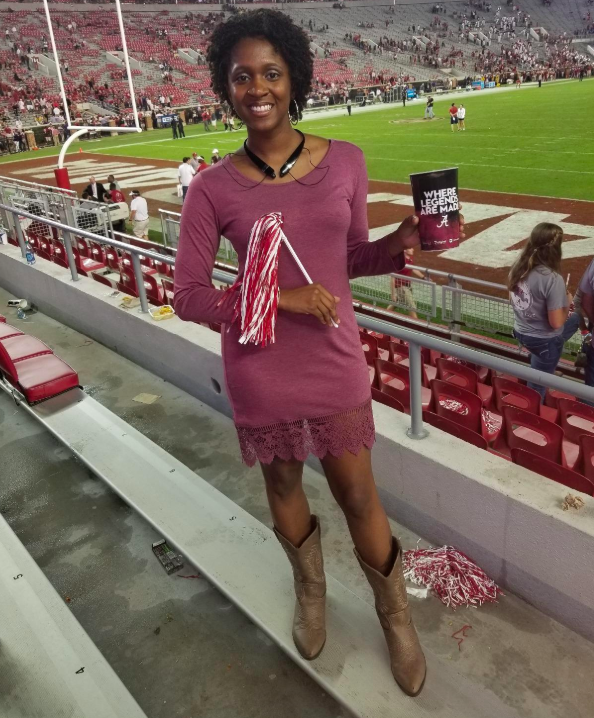 We love a good, versatile dress! Didn't find exactly what you're looking for? Try one of these posts!